The Suzuki Association of the Americas has a web page introducing the Suzuki Method HERE. There is also a page devoted to Dr. Shinichi Suzuki, founder of the method. When are private lessons scheduled? Lessons are scheduled at a mutually convenient time for both the parent and the teacher during the week days. All lessons, groups and solo recitals are at the Guelph Youth Music Centre at 75 Cardigan Street. The large concerts in December and May are at the River Run Centre on the Main Stage. What are the expectations for the parent? Attend your child’s private and group lessons at the school. Play the recordings of pieces to be learned. Guide your child’s daily practice sessions at home. Support your child as she or he learns a new skill. Parents do not need a musical background. The teacher will show you, step-by-step, how to guide your child easily at home. What if I don't wish to play? All parents learn the basic skills required to play the violin, viola or cello. If after, the first year, you do not wish to continue, that is fine; most parents do not continue. If you do wish to continue, we encourage you to obtain your own instrument. Where do I find an instrument? The teachers will size your child in the early fall and will guide you in the right direction to obtain an instrument. There are a few small size violins for rent in the School. All the small size cellos are rentals. The cost is $25/monthly for a violin and $30/monthly for a cello. There are enough rental violins, violas and cellos for all parents at the above rates. 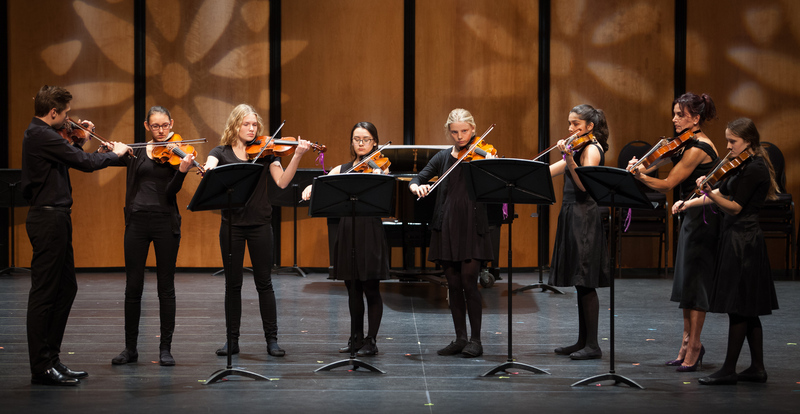 While strongly rooted in the Suzuki Method, all of our teachers are able to prepare intermediate and advanced students for Royal Conservatory of Music examinations and university music requirements. The school also regularly brings in guest teachers for advanced master classes and workshops. There are 6 documents related to different school policies. Please call our administrator Janet Johnson at 519-821-2890 and she will be happy to talk with you further. You can also email email Janet Johnson or Paule Barsalou (our director) if you have other questions.